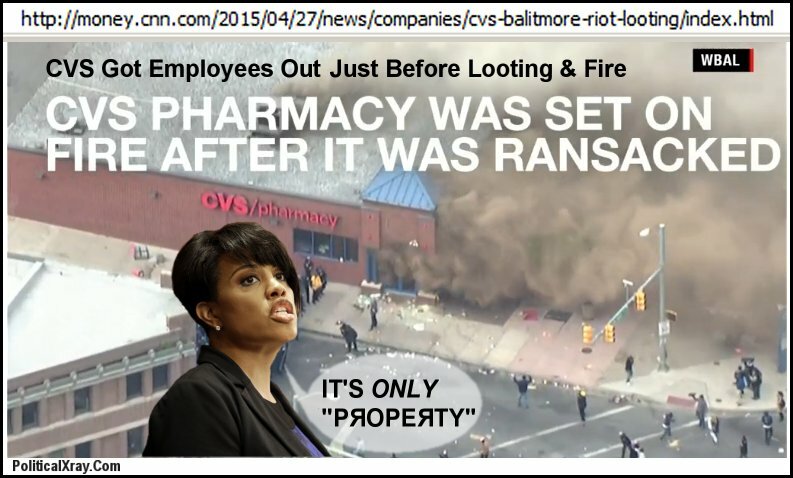 Korrect Kollective Kudos to Ultra-Progressive Baltimore Mayor Stephanie Rawlings-Blake for schooling America on "property" as a capitalist term for oppressing human rights by exhalting things over people. 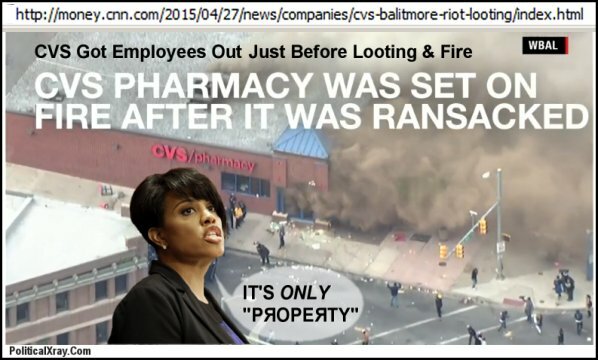 Hence, just in time to end the CVS Pharmacy's oppressive claims of property rights in its merchandize and store and its employees' oppressive claims of property rights in the form of compensation for their labor at CVS, Mayor Rawlings-Blake instructed Baltimore Police to "Let 'em riot and loot -- it's just 'property.'" Rawlings-Blake astutely recognized the riot as a useful teaching experience to refute the outrageous assertion by capitalists that "property" is not a "thing" but rather is a legal manifestation of the human right to own and control the fruits of one's own labor regardless of whether such labor is physical or mental. “Cause and effect” is a mythical notion that can never be applied to Liberal/Marxist/Progressive policy and idea based solutions gained through decades of academic thought and theory. If at first Liberal/Marxist/Progressive policy and idea based solutions appear not to work, it must be because either more thought needs to be given to the subject or the right people have yet to apply them. If at first Liberal/Marxist/Progressive policy and idea based solutions appear not to work, it must be because either more thought needs to be given to the subject or the right people have yet to apply them.<OFF>And Hence, the Current Truth™ is the only valid truth. This is also why we continually refer to the promises of Next Tuesday™ as the proverbial carrot on a stick, ever before the gullible masses, but never quite within their grasp. There will always be a call for more funding, more programs, and just a little more time to reach our Utopian goals. And of course there must ALWAYS be somebody to blame as the scapegoat for why we cannot attain our goals, whether they be Random Folks™, Whitey™, or simply those who cling to their God and their Guns. "And of course there must ALWAYS be somebody to blame as the scapegoat for why we cannot attain our goals, whether they be Random Folks™, Whitey™, or simply those who cling to their God and their Guns." Liberal/Marxist/Progressives have coveted the fomenting of a new revolution to radically and fundamentally transform America into the country our founders (Marx, Lenin, Engels etal) meant for it to be but the slack-jawed, mouth breathing obstructionists insist on clinging, not only to their guns and religion, but the failed ideology which set this country on a path to its inherent racism, warmongering and evil. We tried violent revolution but the simpleton rustics were too stupid to realize their plight and unaware of the hundreds of millions killed by the evils of capitalism and obtusely resisted our efforts to save them from themselves. To our great fortune, stalwart heroes of the failed cultural revolution of the 1970’s recognized the need to incrementalize and undermine public education to create enough useful idiots which in turn led to our most recent gains. Our march to the shining goal of a Socialist Amerika will continue remorselessly until we reach it and then the obstructionists and useful idiots can be eliminated. If we cannot have a revolution with a violent beginning we will be satisfied with one that has a violent end since our purpose is so essential. Since I haven't yet learned to utilize the quote thing I'll have to do this the old fashioned way (reeducation is a constant work in progress for me)Comrade Kommisar Uberdave, Simply click the quote button in the lower right-hand corner of the comment you wish to respond to. You can edit out any bits as you see fit, but you must retain everything that appears between brackets in order to successfully quote others. Education is very important for all Amerikan citizens, although also important is what precisely that education consists of which is why liberals have co-opted every facet of education from daycare to college graduation with Liberal/Marxist/Progressive policy as science, history, and every other conceivable subject. Turning Amerika’s children into legions of useful idiots will help pave the way for the inevitable Liberal/Marxist/Progressive utopia. Welcome to the Cube, comrade Uberdave. You can also edit previous posts by clicking on the "EDIT" button and progressively hide all previous posting errors, making you appear as a PhD in Cubism (not to be confused with the art movement of the early 20th century) and proclaiming that such errors never existed. Editing in poor text allows you to see all the formatting so you can manually correct formatting errors. Quotes are quoted automatically when one hits the "quote" button. The Politburo cannot just let people quote things themselves. That would be anarchy! Each quote is kept in a special NSA database and scanned carefully for counter-revolutionary material, innapropriate references to non-persons, and pictures of Scarlett Johanson (because one of the NSA guys has a real thing for Scarlett Johanson). The quoter and the quotee may both be liable for any trigger words in the quote. It is refreshing to see our edukation continues to bring stalwart souls to the Cube. Welcome, Comrade! 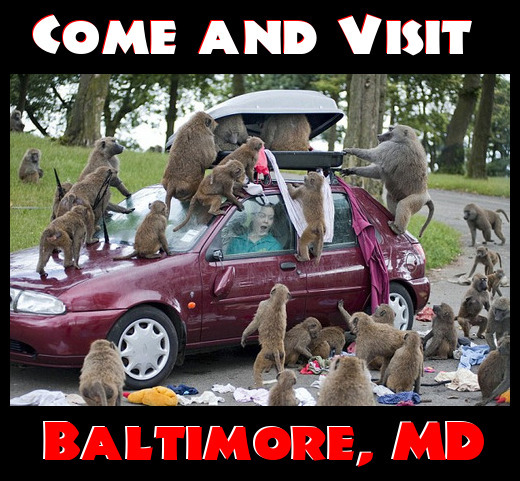 The girls at the mental hygiene institute and myself will be happy to meet any mental or interpersonal needs you have. Our services are a little known but mandatory part of Obamacare. It's a cryin' shame that all their policies and ideas haven't been as wildly successful as the one they've really knocked out of the park, the fundamental transformation of living people into corpses.